Background: Expectant management of asymptomatic gallstones during bariatric procedures has been suggested. The risk factors and risk of developing subsequent symptoms or complications of this specific group remains uncertain. Materials and Methods: After IRB approval, a retrospective review of 796 consecutive patients who underwent laparoscopic Roux-en-Y gastric bypass, adjustable gastric banding, or sleeve gastrectomy between January 2004 and June 2006 was performed. 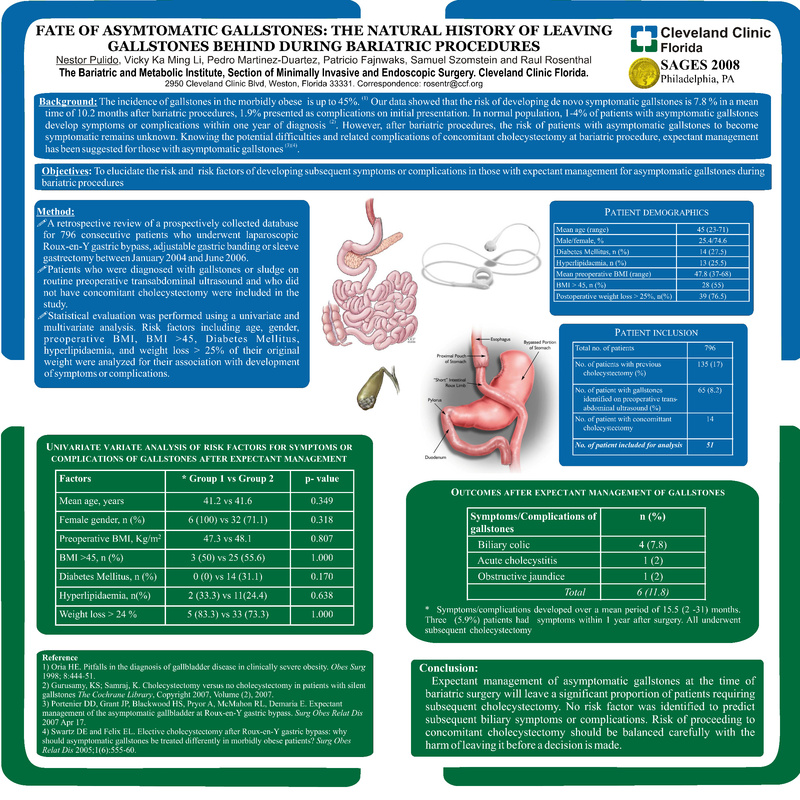 Patients with asymptomatic gallstones but without concomitant cholecystectomy were analyzed for the risk and risk factors to develop symptoms or complications. Results: Of the 796 patients, 65 (8.2%) had gallstones or sludge identified on ultrasound; 51 of these were asymptomatic without concomitant cholecystectomy and were included in our study. The mean age was 45.5 (23-71) years and 25.4% were male. The mean follow up period was 29.3 (12-41) months and 27.5% had diabetes mellitus (DM) and 25.5% had hyperlipidemia. The mean preoperative body mass index (BMI) was 47.8 (37-68) kg/m2 and 55% had a BMI>45kg/m2; 76.5% had weight loss >25% of the original weight. Six (11.8%) patients developed symptoms over a mean period of 15.5 (2-31) months. Three (5.9%) patients had symptoms within one year after surgery. Four (7.8%) patients had biliary colic while 2 (3.9%) developed complications including acute cholecystitis and obstructive jaundice. All required subsequent cholecystectomy. On comparison of risk factors between patients with and without symptomatic gallstones or complications, no statistical significant difference in age (mean: 41.3 vs 46.1 years; p=0.349), female gender (100 vs 72.7%; p=0.314), preoperative BMI (47.3 vs 48.1kg/m2; 0.807), BMI >45 (50 vs 56.8%; p=1), presence of DM (0 vs 31.8%; p=0.123), presence of hyperlipidemia (50 vs 22.7%; p=0.621), and weight loss >25% of original weight (83.3 vs 74.4%; p=0.540) was identified. Conclusion: Expectant management of asymptomatic gallstones at the time of bariatric surgery will leave a significant proportion of patients requiring subsequent cholecystectomy. Risk of proceeding to concomitant cholecystectomy should be balanced carefully with the potential negative effects of not doing so.